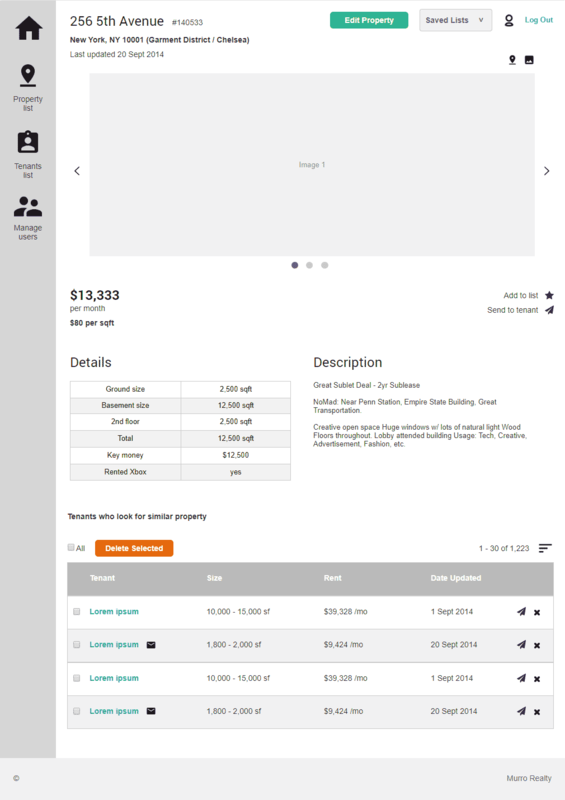 Making a pocket helper for the New York City real estate brokers. Murro Realty is a full-service retail leasing brokerage operating mostly in NYC that deals with celebrity chefs, award winning bars and restaurants, and blue-chip brands. We worked with Cosmo, managing principal of Murro Realty, in the past creating their main web presence not long ago but this time he needed something more practical: an app to make his employees' work a breeze. In short, company was in an urgent need of an automated workflow. At that time existing solutions were heavily based on the residential real estate market, so we had to fine-tune our application for the retail one. We did a research into the problems and pains that realtors faced while doing their job at Murro Realty. It came as a bit of a surprise to learn that to that day most of the work was done manually — records keeping, managing clients preferences, keeping all the data for the properties, etc. Client mentioned that the most time consuming task was trying to match available properties with the tenants requirements, and that was something we had to prioritize when considering solutions. 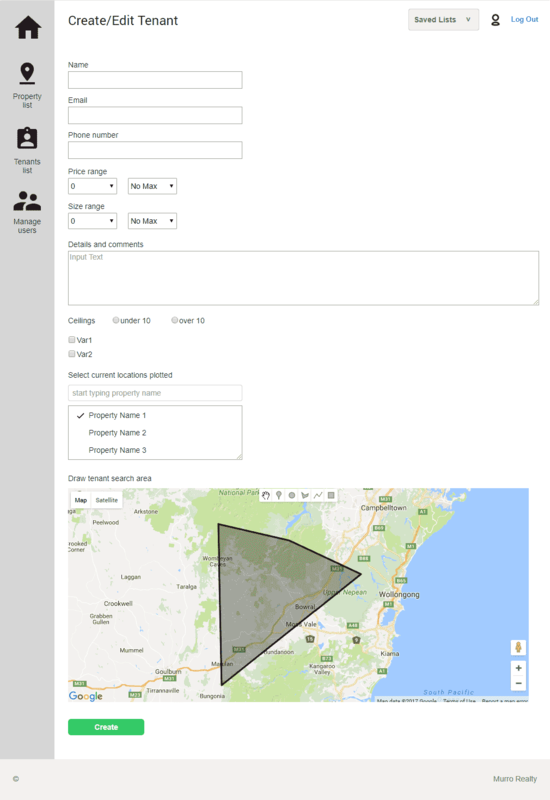 Another task was to create a robust search with multiple filters to pull the exact objects or tenants from the database, and see the results in readable form with compact and detailed versions, and on the map (Google Maps integration was preferred). All of this had to be easily manageable without any superficial features to make brokers' interactions with the system as straightforward as possible. The ideal outcome of the job would have been a system to which client would've fed the existing database of hundreds of properties from a simple csv file. Then content managers would've added objects and tenants data from time to time, and actual agents would've checked this data to see what items match, with some kind of automatic suggestions from the app itself. After some interviews and tests it was clear that indeed the work that took a huge amount of time was the most boring — mostly mechanical comparison of the tenants requirements with the options that properties that were entered into the database had. It was proposed to develop a custom system that would compare the database of tenants with the database of properties and provide recommendations for every entry. That is, every prospective tenant from the database would have had a list of suggested properties that would satisfy all of the requirements (or at least as much as possible). Then only minimal work of ensuring everything indeed fits would be required of brokers (the small percentage of incorrect matches would be unavoidable due to some tenants having some additional non-standard requirements that are usually added as simple comments into the database, and matching against that would have required an actual AI. Alas the programmers I worked with didn't think favourably of an idea of building one for the task). It was also discovered that some kind of visualizing the area of search for tenants was a coveted feature. We decided upon the custom module for the Google Maps that would make use of the simple drawing tools to designate areas relevant to the tenants needs when entering their details, which would also show the search areas in every tenant profile on the map, instead of simply listing boroughs and neighbourhoods. At the same time we would make it so that selecting neighbourhoods or boroughs during data entry would highlight those on the map as well for simplicity when custom areas were not necessary. Thanks to the narrow userbase (realtors and managers of one particular firm) there was no need for coming up with personas or complex user stories. 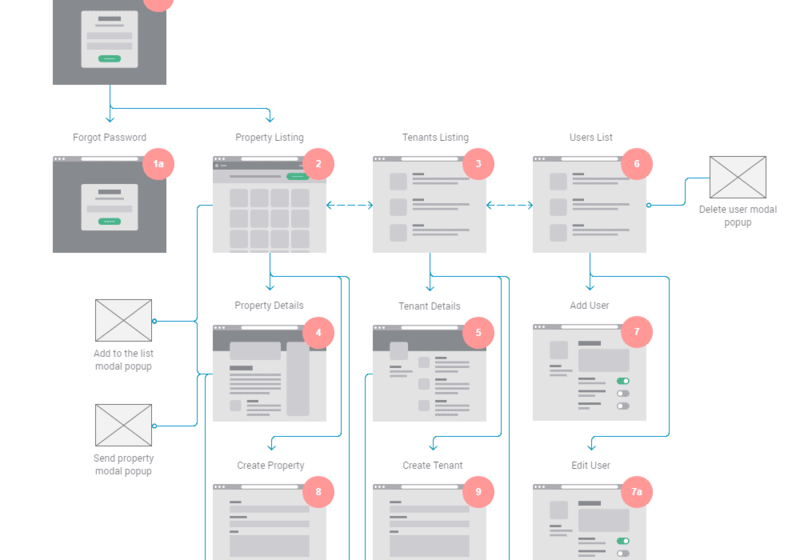 I started with the simple shorthand UI flow (inspired by Ryan Singer's implementation) which described the way users were to interact with the app, making necessary adjustments during the process after getting feedback from actual realtors. 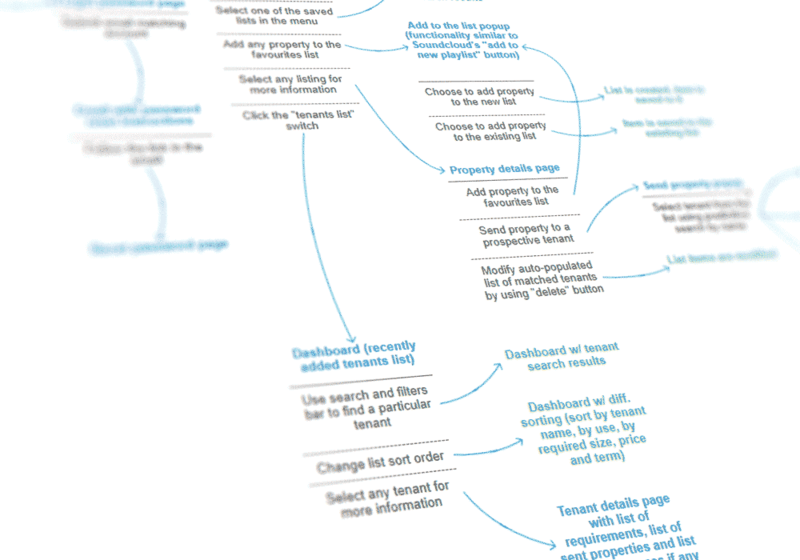 This was translated into the sitemap for the future app and was a basis for creating the prototype pages. After that I used Axure for prototyping the low fidelity mockups before actually doing the graphic UI. This way the amount of time spent was optimized and divided between graphic work and UX so that almost no resources were wasted in the process. I used Webflow for high-fidelity prototypes as this is often my go-to application for quickly creating interfaces, graphics, interactions, and animations, which can easily be handed over to the developers for complex integrations or used as is for simpler promo and informational websites. 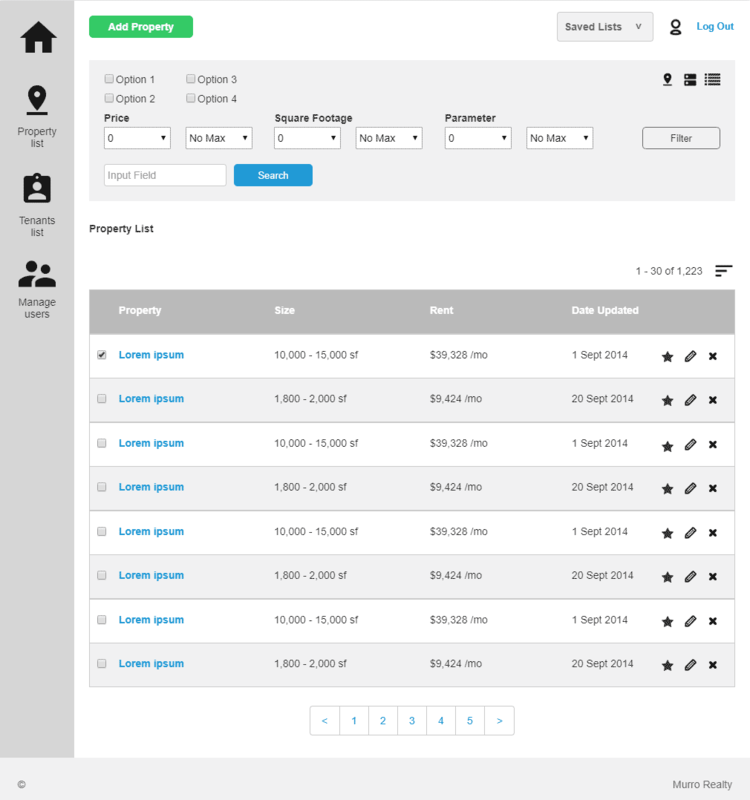 Developers used Yii2 framework to create custom web app with all the required functionality and more goodies that were deemed necessary during production, even if client had no idea he would need them. Autopopulating property names from addresses entered, multi-functional drawing tool for Google Maps with extremely powerful matching algorithm to handle the free-form areas etc. The project is still under supervision for any necessary changes or additional functionality that may become needed during company expansion.